In a heavy-bottomed soup pot, sauté the onions in the oil over medium heat for 6 to 8 minutes. Add the leek and garlic and cook another 2 to 3 minutes, stirring often. Add the wine and tomato paste and cook for 1-2 minutes. then simmer, partially covered until lentils are nearly tender, about 20 minutes. While soup is cooking, cook the sausage in a skillet, breaking it up as you go. Set aside. 3. Add tomatoes, salt and pepper, and simmer another 10 minutes, or until lentils are fully cooked. 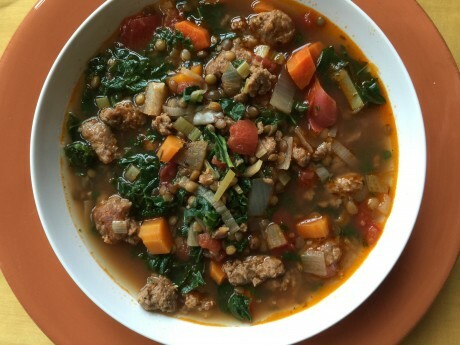 Adjust seasonings, add sausage and spinach and simmer for an additional few minutes until spinach is wilted.